To start our Saturday, we went and got breakfast at Sweetpea Baking Company (a vegan bakery) which is in the Buckman neighborhood of Portland. I got an iced Americano and a delicious almond ring pastry. This place is really good; we always visit whenever we’re in town. Enjoying my coffee while watching some puppies wrestlin’ outside the window. 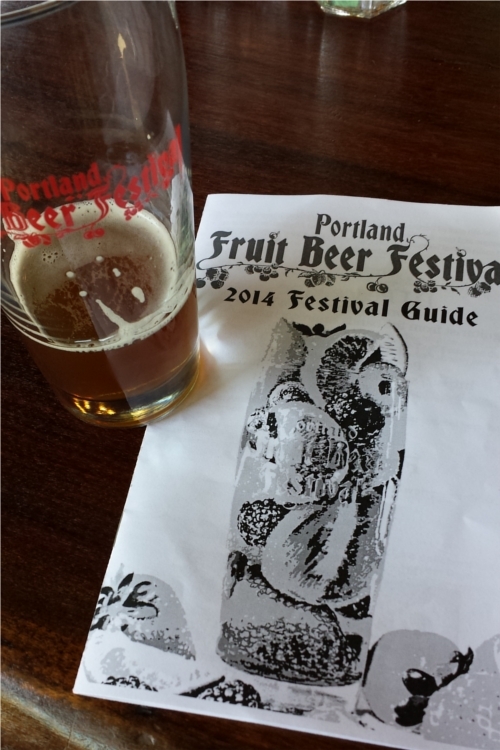 The main activity that we had planned today (and really, this is the thing helped us decide to come down to Portland on this particular weekend) was attending the Portland Fruit Beer Festival hosted by the Burnside Brewing Company. We wanted to get there fairly early before the crowds got too nuts-o (the festival started at 11 am), so we headed over after we finished our coffee. Luckily, the brewery is only about ten blocks away from the bakery, which meant we could just walk up. We got there at the perfect time. There were enough folks milling around so that the environment felt festive, but not so many that you had to wait in line to get beer. As part of admission, each person got a commemorative pint glass and 12 tickets good for samplin’. Most of the samples “cost” one ticket for a 3 oz. taste, but some of the fancier/rarer/higher ABV stuff was two or three tickets. The majority of the pourers were ~sticklers about not giving you more than 3 oz., but a few of the guys were pretty generous and filled your glass halfway. Woo! There were more than 45 kinds of beers and ciders from ~30 different breweries available for tasting. Festival guide (left) and Stephanie enjoying Ecliptic Brewing’s Lacerta Frambuesa (right). Between the two of us, Stephanie and I tried 18 different varieties. While we were sippin’ on our beverages, we split an order of pretzel knots and a bucket of truffle fries. My favorite drinks on the day were the Peach Slap by Deschutes Brewery (a semi-sour ale with strong peach, peppercorn, and juniper berry flavors – absolutely my favorite drink today), the Sweet Triple Hot ¡Tepache! by Reverend Nat’s Hard Cider (pineapple juice fermented with habenero, aji, and ghost peppers – sweet with a pretty good kick; pineapple pairs so well spicy), and The Tiger Cub by Stone Brewing (a very sour saison with a strong cherry flavor – mouth-puckeringly delicious). 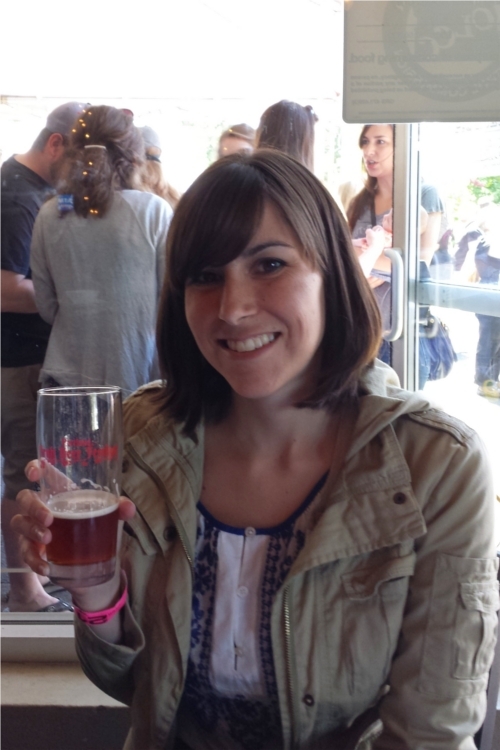 Stephanie’s favorite (which I also enjoyed a lot) was a Belgian Framboise infused with cocoa nibs and raspberries. By the time we left (around 2 pm), the place was packed. We had to stand in line for ~10 minutes to get our last sample. I’m glad that we got there as early as we did. 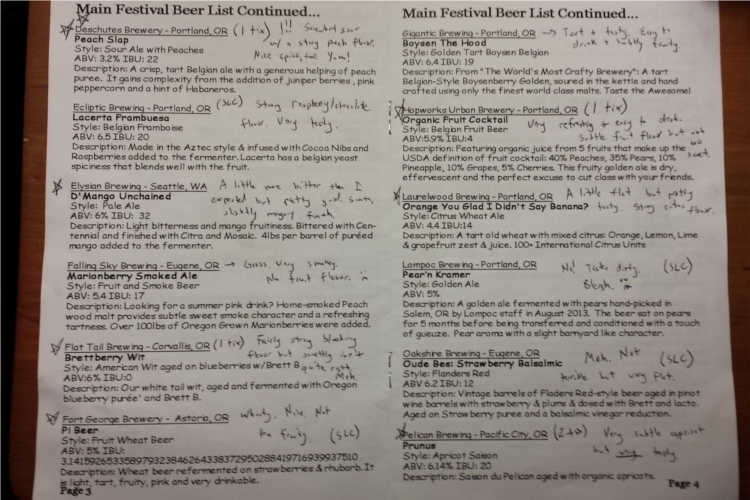 Hastily scribbled notes about some of the different beers we sampled. 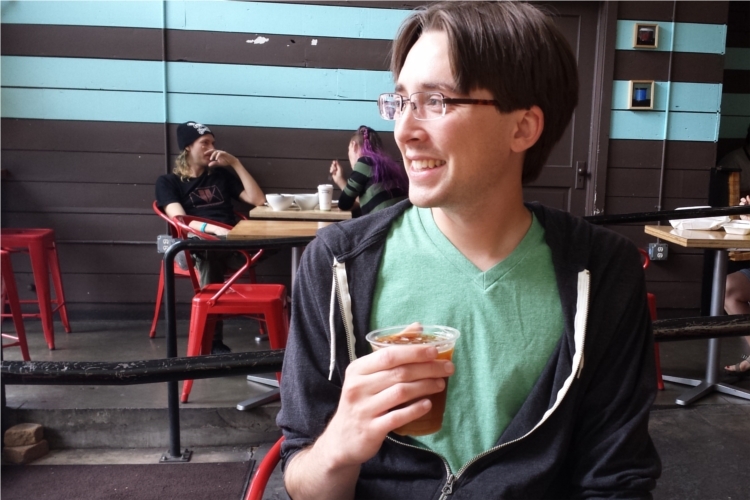 Once we left the brewery, we mosied over to downtown Portland and made our obligatory visit to Powell’s. We also walked through the Saturday market and did a fair amount of window shoppin’. It was really nice out, so it was pleasant to just wander around ~aimlessly. For dinner, we went to Sushi Ahi. It was okay (not great). 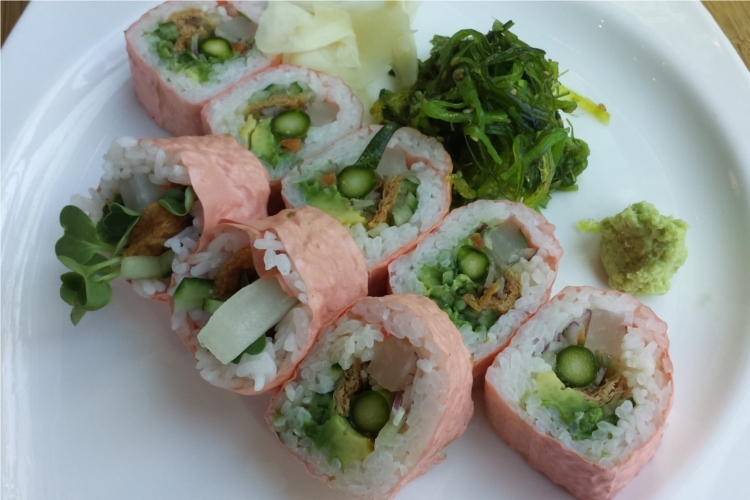 Sushi is definitely one of my favorite warm-weather foods because it’s so light and fresh and easy to eat. Unfortunately, the menu they had in the restaurant was significantly different than the one on their website (way fewer veggie sushi rolls), so we ended up mostly ordering a bunch of veggie appetizers/starters. They did have one vegetarian roll (the SUPER VEGGIE), which we did get. It had a whole lot goin’ on, but it was good. We also split an avocado+tofu caprese salad, some deep fried tofu wrapped in daikon, some broiled taro potatoes in miso paste, and some edamame. Super Veggie: cucumber, avocado, oshinko, gobo, kaiware, inari, and asparagus wrapped in soy paper. Oh my! After dinner, we went out for a drink at Hereafter (the sister bar to The Bye and Bye). It was still really nice out, so we sat out on their back patio. I ordered a tart n’ tasty black currant cider and Stephanie had a glass of red wine. Once we finished our drinks, we went back to the hotel and watched a few episodes of Chopped. Another successful day in Portland!